Gilt yields end 17 basis points higher with signs of rising inflation and annuity rates continue upwards for the fifth consecutive month. 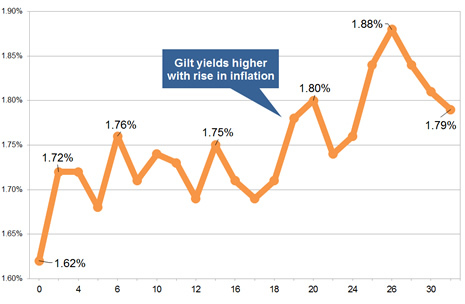 The 15-year gilt yields increased to 1.79% by 17 basis points during the month. There are signs of rising inflation as US economic reports show signs of rising inflation. In the UK inflation was higher rising from 1.2% in November to 1.6% in December. Standard providers increase rates by an average of 1.09% and we would expect in the short term rates may increase by 0.61%. 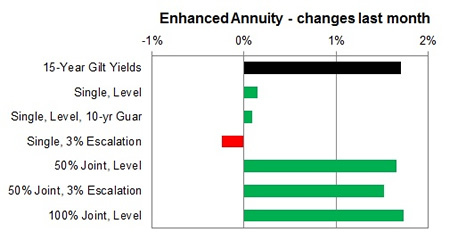 For smoker and enhanced annuity providers increased their rates by an average of 0.51% on average and in the short term rates may increase by 1.19%. For the month of January 71% of annuity rates increased by up to 2.6% with 12% remaining unchanged and 17% decreasing by no more than 2.1%. 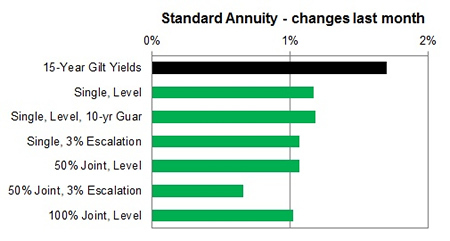 Standard annuities increased by an average of 1.09% during the month. 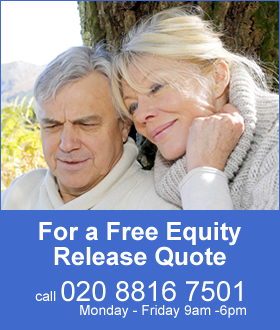 For those aged 55 to 60 buying a single life or joint life on a level basis with increases of up to 2.6%. For enhanced and smoker providers rates increased by an average of 0.51% with a larger rise of 3.0% for those aged 55 buying 100% joint life, level annuity. The highest decrease was for those aged 55 with single life 3% escalating rate reducing by 2.1%.